The Baby Naming or Name Giving Ceremony is the highlight of the day; and one of the most memorable as parents you make promises and reaffirm your love and plans for the future of the child. What you say and what is done in the ceremony seals the love between you. The Circle of Life. Baby Naming or Name Giving Ceremony enables you to consider your dreams for your child’s future and openly declare your love and support for the child as an individual human being. We will work together as Celebrant and parent(s) to ensure your child’s ceremony is unique offering suggestions and ideas to find the right words, poems and if requires music. 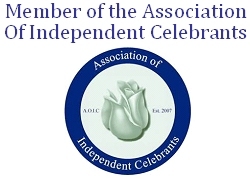 As an Independent Celebrant, I can include some religious or non religious elements in the ceremony, perhaps to reflect the mixed religions of the parents or family, non-religious to reflection your cultural identity and background. I can create ceremonies for newly-born, older children and adopted children. You can hold your Baby Naming Ceremony or Name Giving Ceremony at home, a community hall or commercial businesses such as hotels at any time of the day or evening. The role of Special Adults is akin to godparents at a christening – they make promises of commitment and support to the child and sometimes to the parents. These can be referred to by a variety of names - Supporting Adults, Mentors, Guide - parents. There is no required number; it’s entirely up to you. Religious welfare aside, the criteria for choosing Special Adults are usually similar to those for Godparents. You may like to recognise the special bond between grandparents and grandchild by giving the option of including them in commitments made to the child. The following illustrates the typical structure of a ceremony. Readings and music can be incorporated in the ceremony. Depending on the number of readings and the options chosen, the ceremony usually lasts about 20 minutes. A baby naming ceremony does not replace the need to register your baby’s birth. This must be done within 42 days of birth in England and Wales and 21 days in Scotland.